Welsh golfer Rhys Davies ended his "horrible" five-year wait for a title with a four-shot victory at the Turkish Airlines Challenge. A two-under-par 70 at the Gloria Golf Resort in Belek was enough to secure his first win since the 2010 Trophée Hassan on the European Tour. 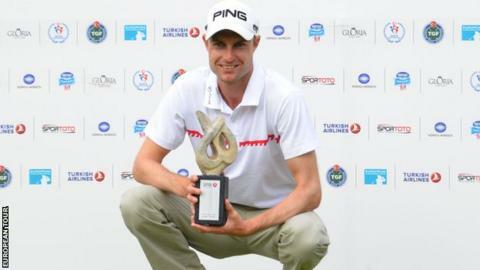 The 29-year-old finished 14 under overall in Turkey to seal a third career European Challenge Tour title. "It's a bit of a surprise to be honest," said Davies. "Sometimes it's been really horrible in the last couple of years, I'm not going to pretend. "It does feel like a long time since I've won, but it's strange that when you get in the mix everything floods back to you." Davies finished four shots ahead of runner-up Lorenzo Gagli from Italy. The Welshman's victory capped a significant revival after a difficult few years for the Bridgend player, who was ranked 44th in the world in 2010 before falling to 181st place in 2014. "It's been quite dark sometimes, but I always felt that if I could get in the mix I could win again. I didn't doubt that to be honest," said Davies. "But I couldn't see it happening any time soon at various moments. "I've been very fortunate that a number of people have been very supportive of me during my tough times. "[Former Ryder Cup player] Phillip Price is one in particular. He's been exceptionally supportive."